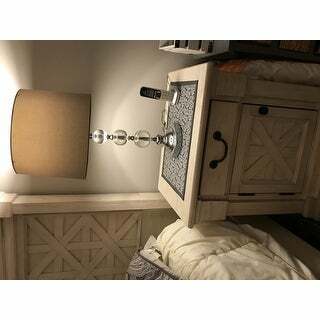 Position this pair of Keeva table lamps on your nightstands to add visual interest and bright reading lighting to your bedroom. Stacked crystal balls atop a gleaming chrome base combine with grey linen drum shades to create an upscale, opulent look that's at home in both traditional and contemporary aesthetics. 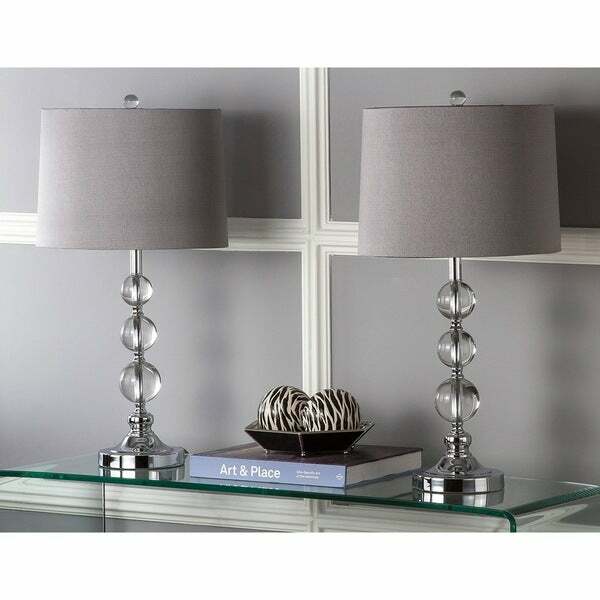 The Safavieh Lighting Keeva Grey Shade and Clear Crystal Ball 27-inch Table Lamps are by far my favorite purchase on Overstock so far. They are of amazing quality and look magnificent. I originally had bought them to place upon my nightstands-but, will be moving them to my living room to give them more attention. The grey has a very light purple undertone which is difficult to find! I ABSOLUTELY love these lamps. I was holding out for a crystal type base with grey shade. They are so pretty lit ( taupe tone ) and unlit. So many compliments. They pair well with my taupe and ivory living room. 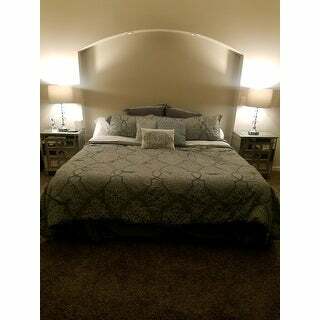 I bought theses lamps for my master bedroom and was delighted with the color and quality of them. I would buy them again and recommend them too..
Much nicer than the pictures. The glass looks very thick. Even the wire is of good quality with a gray fabric covering. Shades are nice, too. I wanted a set of lamps to add a contemporary touch to my living room. 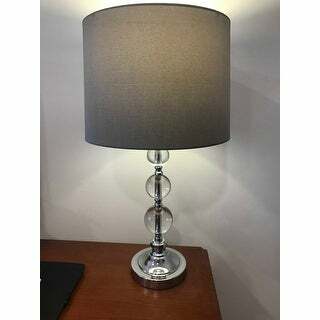 The three crystal balls, shiny silver base and dark grey round shade provide great light to lamps that can only be described as eye catching. Absolutely love these lamps! Perfect addition to my bedroom makeover! great light from the LED bulbs (that came with the lamps!) 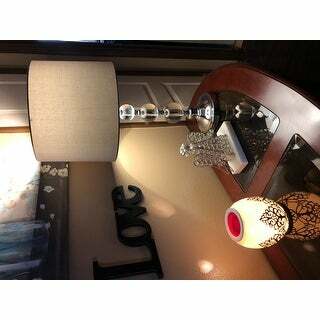 and they add a beautiful touch of glamour to the room with the clear crystal ball stems! The grey colored shades are darker than I thought they would be but still look great! Deliver was much faster than I expected too! love the lights! much better quality than expected and for a great price! perfect on each side of bed. so glad I bought these. 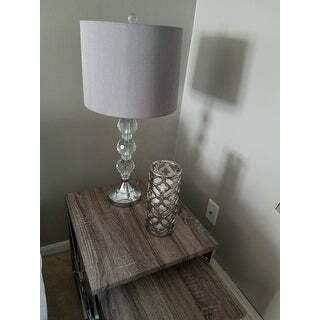 I was debating buying similar bases at a popular retail store, but it was actually cheaper and nicer to get these with the lamp shades ready to go. So worth it! you won't be disappointed. the top screw on knob adds an extra elegance too. posting pics. 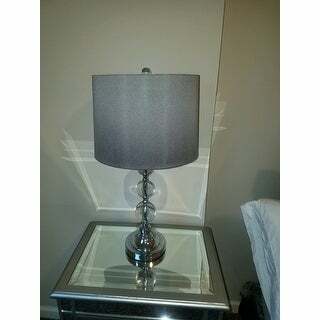 Bought these lamps for my new off white bedroom set and they look terrific! Couldn’t be more pleased. Gorgeous Lamps Pictures do not do these lamps justice, I am constantly getting complemented on these lamps in my living room! LOVE THEM worth the buy!!! After looking forever, and several returns, I finally got these lamps for my living room. Absolutely gorgeous! Good quality, well made & perfect fit. 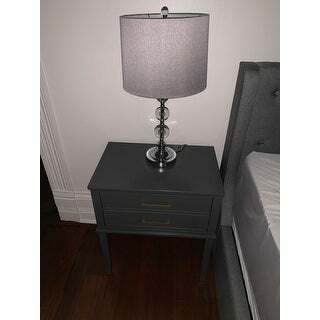 Perfect lamps for our bedroom nightstands. Not too feminine and not too masculine. Nicely shaped shade keeps it modern and the grey color of the shade lends a nice ambient light to room. 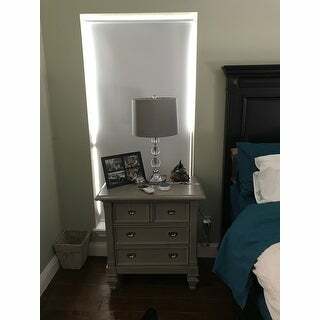 I bought these for my master bedroom and they look great and seem to be good quality. They were packaged very securely and arrived in perfect condition. Would recommend to anyone looking for contemporary lamps. 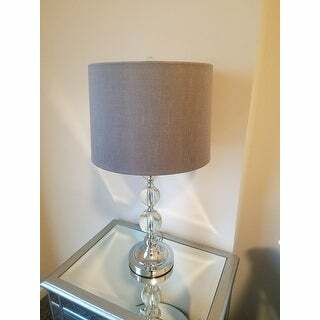 Great lamps, also comes with a very bright LED light. Highly recommend these lamps. Pretty, easy to assemble, light bulbs included. Great price. 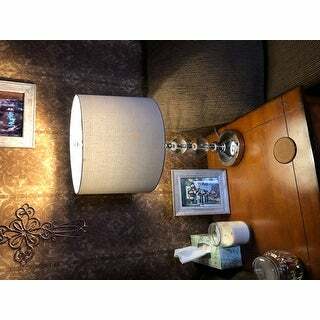 Great price for truly great looking lamps. I have them on each nightstand in our master bedroom. 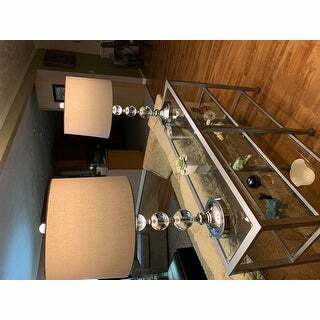 Very beautiful lamps, glass balls on top are not attached so don’t panic just get a little of gorilla glue or a clear adhesive and they will stay a lot of very nice compliments on them. 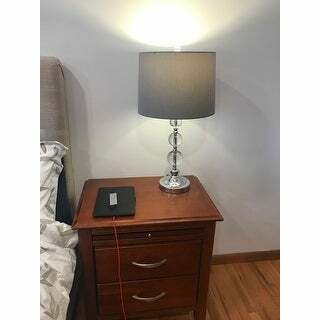 These lamps even better in person than the picture and description. They are just beautiful. I love them!! "My furniture is a dark grey. 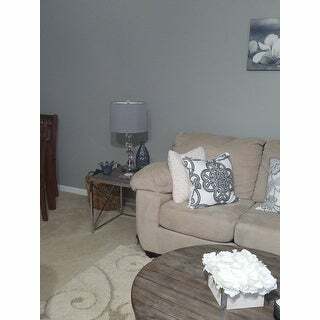 will be painting my walls a lighter grey. 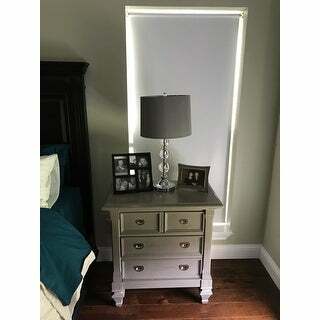 How dark are the shades and will it be a match for the furniture?" The grey is more a medium grey. I think the color would match Just fine. 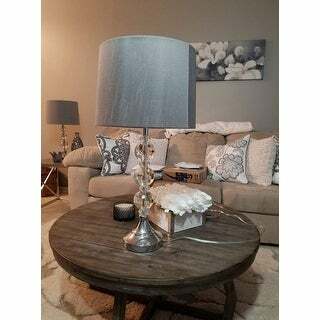 I purchase rugs on here too that match with these lamps great. The lamps are slightly a different color but you can not tell after it's all set up. It looks great. The body material is made of crystal. "Do you have this in a floor lamp?" No, but the table lamps are beautiful. No, it is way to short. It is perfect for nightstand. Love them though they look amazing. For the price it is a great deal! "Is it possible to order with a white shade?" "Is the height from the bottom of the bar to the top of the lamp shade? " The height listed includes the shade. "Is it possible to take these apart to spray paint them a brass / gold tone?" It does not come apart. Please note that making these kinds of alterations to our products voids the ability to receive a refund/replacement.